In the second half of the 20th century, four of the most exceptional chord melody guitarists emerged on the jazz guitar scene. In this four-part series of posts, you’re going to learn about these important players lives, their style, and how they each of them made a huge impact on jazz guitar as we know it. You’re also going to learn classic licks and transcriptions of these players so you can incorporate their ideas into your own playing. As you’ll discover, chord melody allows for a lot of individual expression and creativity. Each of these players had a groundbreaking approach to chord melody with a sound totally unique to their own. Let’s see what’s possible with chord melody guitar, starting with one of my favorite players, Ed Bickert. Cool Bonus: Download my FREE eBook, Chord Melody Guitar Basics: a 42 page guide on creating your own chord melody arrangements that sound great – in just 5 simple steps. Though he was not well known, I consider Ed Bickert to be one of the trailblazers of jazz guitar. I’ll go even further to say that Ed Bickert is one of the greatest jazz guitarists the world has ever seen – I think his name deserves as much recognition as Joe Pass or Wes Montgomery. Bickert had very innovative approaches to chords and chord melody playing, as you’ll see in some of the examples below. Ed Bickert was born in Manitoba, Canada, to a family of farmers. His parents were musical, with his father being a fiddler and his mother a pianist. Deciding to pursue music instead of farming, Bickert quickly established himself as a success, becoming one of the top jazz and studio guitarists of the scene in Toronto in the 60s. But Bickert’s real lucky break came when he was introduced to Paul Desmond by Jim Hall, (Ed and Jim were friends), which led to several collaborations between Desmond and Bickert. Bickert continued to play until the early 2000s, when he then retired. Unlike other jazz masters, Bickert quietly pursued his art and didn’t overtly seek fame or success. I think this is one of the reasons why Bickert developed such a uniquely personal style, as genuine as it is groundbreaking. Now, let’s check out some of his playing. But a video is worth a million. If I was only allowed to choose one player to emulate in a trio setting it would be Ed Bickert – laid back yet refined, I could listen to him all day long. As Bickert plays a solo he often interchanges between single line, chord stabs and full chord soloing, skilfully creating interest and variety as you can hear in the video above. What I love most about Bickert’s playing is his unique approach to chord voicings: easy on the hands, but very sophisticated. Bickert was the master of implying harmony with chords. His chords give the impression to the listener of many more notes being played in the voicings than what is actually there. For jazz guitar, it’s usually only practical to play three or four note chords, so you need to make sure you get the most ‘bang-for-your-buck’ out of the chord tones for each shape you hold down. Bickert’s voicings live on the upper structures of the harmony: he rarely plays the root or 5th in his chords and often uses quartal approaches. If you try to play Bickert’s voicings unaccompanied, they can often seem quite dissonant and unrelated to the given harmony. But, in the context of a trio, they blend in beautifully – giving a warm, listenable, and attention grabbing sound to your comping and chord solos. No more armchair jazz guitar! It’s time for you to get to work now. Get started by learning the following 3 licks in the style of Ed Bickert, which are strong examples of his key ideas. This first lick, based on a I – vi – ii – V turnaround, features colorful chord voicings at every turn. Notice the skillful ‘smooth as silk’ voice leading that Bickert employs in this lick as he moves from chord to chord. Also noteworthy is that all the chords in this lick are rootless voicings. If you’re playing in a trio, the bass player is usually playing the root notes, freeing you up to play more colorful tones on top. Whilst this lick might sound a bit strange unaccompanied, try it along with the recording and it will make sense. In this lick, Bickert employs open strings to great effect. Bickert liked using chord clusters, i.e groups of notes very close together. Employing open strings results in a chord cluster which can be otherwise be too tricky to play on guitar. Again you’ll see the use of entirely rootless voicings, with Bickert playing exclusively in the upper structures of the harmony. Also, notice that deliciously smooth voice leading that Ed Bickert is renowned for. The first chord is a sub of the iim7 chord, becoming a V/V7. There’s also lots of chords in this lick with a b13 tension, giving it a really hip sound. As this lick finishes on a I7 chord in the harmony, it’s a good one to use for a jazz blues progression. Despite being the musical equivalent of a ‘hidden yogi’, Ed Bickert is a master musician and essential study for any serious chord melody jazz guitarist. His chord voicings are sophisticated yet easy to apply, which will give you a dynamic sound in your chord melodies and will help break you away from the more stock standard drop 2 and drop 3 chord voicings. I encourage you to find out more about this fabulous player, one who should be more well known to jazz guitarists everywhere. 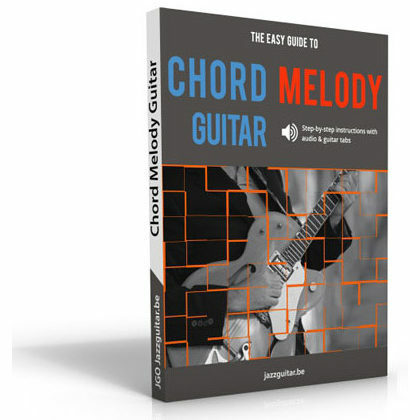 My New eBook, The Easy Guide To Chord Melody Guitar – Out Now! I’m pleased to announce that Matt Warnock of Jazz Guitar Online and myself have spent this year co-writing a comprehensive guide on arranging chord melodies and how to master the art of chord soloing, entitled The Easy Guide To Chord Melody Guitar. A-Z guide on creating your own great sounding chord melody arrangements for trio and solo guitar situations, and you’ll also learn how to chord solo (i.e., improvise with chords) like a pro. We’ve heavily referenced Ed Bickert throughout this book, so check it out if you’re keen to learn more about this genius of jazz guitar. I hope today’s post has inspired you to learn more about Ed Bickert. Let me know what you think about this article by leaving a comment below. In the next installment of this 4 part series, you’re going to learn about a guitarist known as the ‘Chord Chemist’. Do you know who it is? Keep a lookout for the upcoming post to find out! Thank you Greg for hipping your followers to Mr. Ed Bickert. His tone and his playing are really pleasing to the ears. Time to dig into these three juicy jazz licks. Thanks again Sensei Greg! My pleasure Lou – I think every jazz player should learn Ed Bickert’s lines, you can learn a lot from them. Thanks …can I buy the chord melody book with a iTunes card? Have been a fan and admirer of Ed Bickert since the early ’60s – one of the greatest guitarists of all time, and grossly under-rated! His trademark (almost pianistic) voicings put him up there along with Lenny Breau, Joe Pass, Tal Farlow, Charlie Christian, Barney Kessel, Herb Ellis, Ted Green, and all the other “greats” who have left us. Thank you for presenting this article and bringing Ed B. to the attention of those who may not have heard him before. Would LOVE to see more examples of Ed’s chordal licks. Thank you very much indeed for this wonderful instruction. “upper structure” you mentioned and what is even more – the linear structure. Piano players often continue dissonant lines in the bass of their chords which is quite easy if you have 10 possibilities instead of 3-4 strings -and not only quarts but tritones. If we try that in OUR instrument that leads to transitient chords that do not really exit in our “chord lists”. I think I could hear something of that kind in Ed’s 1st vid. Would you perhaps post some melody chord lines for us that highlite that phenomenum? ? Perhaps YOU could post something about presenting themes in a way the pianist do instead of mere “sheet music”? Lovely article Greg. I purchased “The Paul Desmond Quartet Live” album in 1975. I was 17 then. I still have the original vinyl! This has always proved to be one of my favourites, but mainly from the point of view of Paul Desmond’s saxophone playing. I have always revered him for his unbelievably charming and subtle tone and style. Thinking about it now, Ed Bickert’s style, as described in your article, compliments Paul’s perfectly. I shall listen to the album again with new ears. Thanks Gordon! Yes that’s a great album, listen to Ed’s comping on that one and you’ll notice how inconspicuous it is but adds an incredible support to the soloist. Fantastic stuff. Thanks for your kind feedback Marcus! Great idea hipping others to Ed Bickert. One of the original jazz Tele masters. It’s amazing how he coaxes such great tones from a plank of wood! ;-) I’ve had the opportunity to attend some performances of Ed Bickert in a small club in Montreal. He was using his Tele through a pair of old Roland cube amps; one of the orange coloured ones (Cube 60 I believe), and the other was the same size but had a silver/grey cover (a keyboard Cube I think). Anyhow I’ll always cherish hearing him play in such a setting. Thanks for the 3 Bickert snippets… I’ll use them well (I hope). Hi Glenn, great to hear from you and it’s fantastic you got to hear Ed Bickert play in the flesh!